I was so psyched that the winner of this week's Sunday Puzzle Susan Fischer from Kitakyushu, Japan listens to the puzzle by downloading the podcast!! Obviously she can't get NPR on the radio in Japan. She was a long time player that started from the days of the postcard entries. It just goes to show the inroads that podcasting is making. In the RSS feed blurb, it says "She listens to Weekend Edition on the Web" which is not quite the same, but I guess more understandable to the general reader. If I ever enter the contest (I've only figured out one puzzle so far but was too chicken to enter), I will say that I've only been playing the puzzle since it's been a podcast. Just like the internet has changed information distribution forever, podcasting will change audio distribution as well. It will hopefully be the end to endlessly bad radio as we know it! Wow...NPR has so many Podcasts that it numbs my mind looking through the huge list! But really....I like the sound of this Podcast...and being on Sunday is perfect because in theory...my mind is relaxing and has a few cycles to play with. Oh, and if I don't, I can just skip a week...and not feel guilty! I'll have to look at that NPR list of Podcasts again....I'll add that task to my schedule for next Sunday. 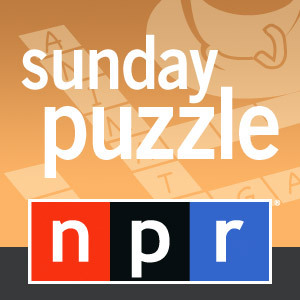 I'm having some problems when I download the NPR: Sunday Puzzle Podcasts. My Nomad transfer software complains that the file of of the wrong format.